Suite Three is a two bedroom suite on the ground floor and ideally set for those occasions where a second bedroom is of benefit. This sizable suite is 137 square metres in scale and is composed of a master bedroom, second bedroom, bathroom, separate WC, study and generous private sitting room. 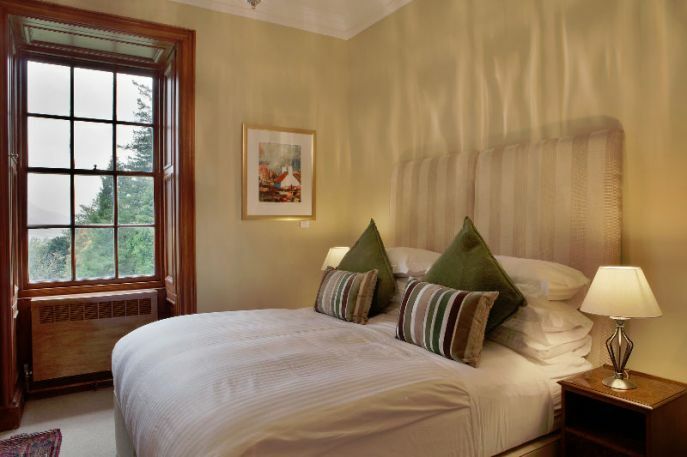 All rooms enjoy panoramic views of Loch Leven and are ideally situated to enjoy the spectacular Highland sunsets. To see for yourself please click on the arrow below, contained within the image, to view a short film of this suite. The total floor space of Suite Three is 137 sqm / 1474 ft2, please download the floor plan and brochure here. 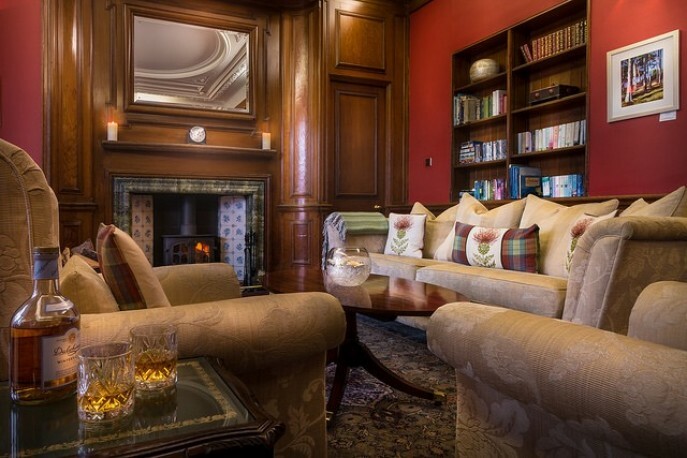 One of the key defining features of Glencoe House’s elegant accommodation is your personal private sitting room, which creates the ultimate retreat and hideaway. As the name suggests, the private sitting room of this suite was Lord Strathcona’s library and is 42 square metres in size. Decorated in a warm red colour, this room lends itself to relaxation and contemplation. The room contains striking original jade coloured marble open fireplace with a wood burning stove, which can be lit to give a warm glow of an afternoon or in the evening while enjoying a drink from the generously stocked ‘maxi’ bar. The ceiling retains the original plasterwork and the walls are lined with the original Victorian bookshelves. Other period features include the solid oak flooring and original window shutters. For those who want to relax and unwind, this room offers the comfort of a sumptuous sofa and chairs in order to recline while watching the 42 inch flat screen television or listening to tracks from Glencoe House audio library (19,000 songs) on an iPod. Tea & coffee is but a step away with your Nespresso coffee machine in your room. Overall the sitting room offers the luxury of choices no matter how ambitious or un-ambitious your plans might be. 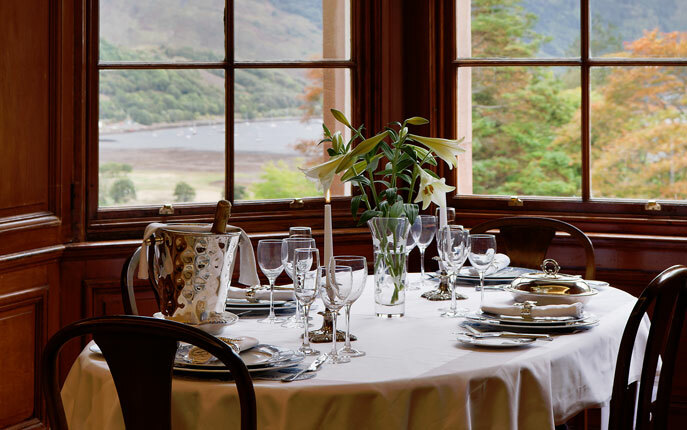 Breakfast is a relaxed affair, which is served at a time of your pleasing at your personal, full-sized dining table in the sitting room, which can be enjoyed while admiring the spectacular view of Loch Leven and contemplating the day’s activities together with your choice of daily newspapers. 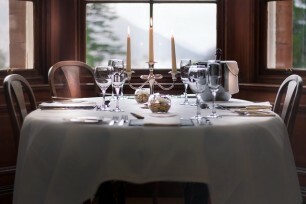 If you are travelling with friends and family, it is useful to note that this suite can seat up to 10 guests for dinner. The suite also has provision for those who need to work with an antique pedestal desk, personalised stationary and office equipment together with wireless internet connection throughout the building. The well proportioned master bedroom is 31 square metres and gains from two large windows that look down Loch Leven, which is a remarkable way to begin your day. 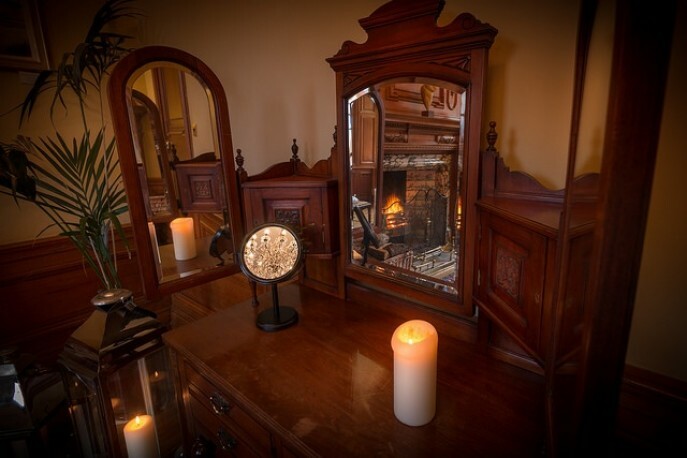 The original period features are shown off to good effect in the evening by the twelve branch crystal chandelier. 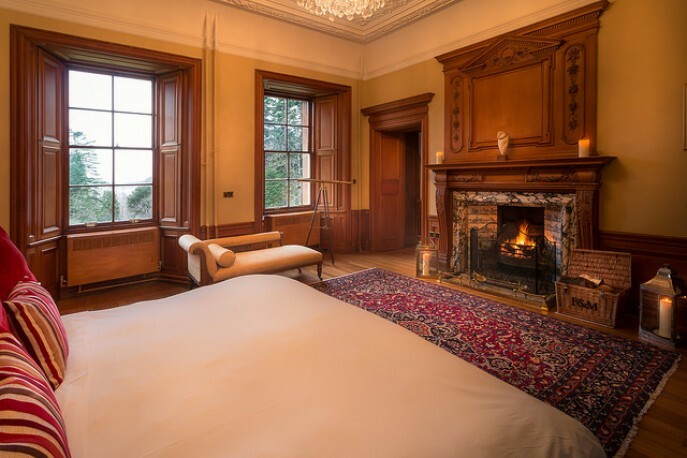 The original period features include a large marble open fireplace and intricately carved oak mantlepiece, oak panelling, solid oak flooring and ornate plaster ceiling. The “Glencoe House Rejuvenating Bed Concept” allows for a restful and restoring night and is tailored to your every need. 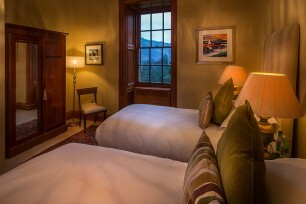 We offer a turndown service that includes closing the window shutters and a hot water bottle to warm the bed if desired. The antique mahogany dressing table and wardrobe add the finishing touches to an elegant and tasteful room. The second bedroom is a good proportion at 16 square metres and can accommodate either a super king size bed or two twin beds. The original cornices are still in place and this room is lit by crystal chandelier. 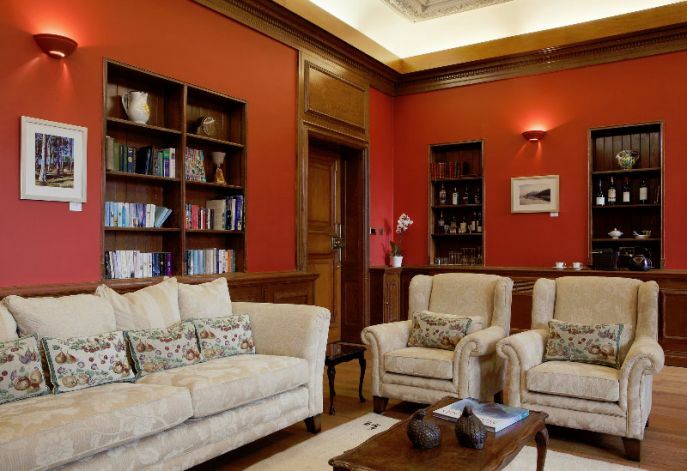 Originally Lord Strathcona’s study, enjoys views of Loch Leven. At 18 square metres, this bathroom offers extravagance, opulence and indulgence in equal measures. 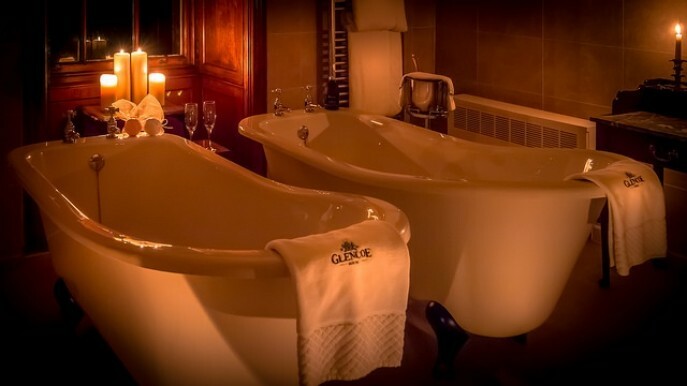 There is no need to negotiate who bathes first as this bathroom boasts twin free standing slipper baths that stand side by side with only a champagne bucket and glasses between them. The crystal chandelier and marble top wash stand continues the sumptuous feel of this room. 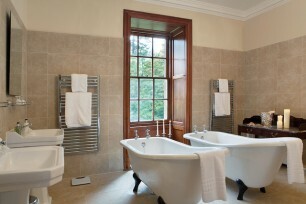 The bathroom also contains the “Glencoe House Energising Shower Concept” and ‘his’ and ‘her’s’ wash hand basins for that extra touch. The bathroom toiletries extend the sense of opulence with the generously full sized bottles of Aveda products.